What do you know about the Mazda car brand? In my opinion many motorists have little idea about the background or products of this very far thinking car maker. Using conventional logic Mazda has produced the world’s best selling sports car, the MX5, bucking the trend it won Le Mans with a rotary engined racer and more recently it has launched a range of upper market products in conventional Hatch Back/Tourer and Cross-Over forms but with innovative petrol and diesel engines coupled to electronic energy harvesting systems. Additionally, the Mazda UK dealership network has consistently been at the top of the ratings posted by customers representing an extensive range of car brands – when buying any car it is worth checking the dealership performance records. Strongly nudging into the premium class is the latest Mazda6, tested by me at launch about 18 months ago in Hatch Back form and powered by the most potent of the two turbo diesel engines on offer. Both are 2.2-litre 4-cylinder units, developing 173/148 bhp and driving through either a 6-speed manual gearbox or a 6-speed automatic units. That saloon model seems to be faring pretty well on the sales charts if the numbers I have seen when travelling in both Europe and the UK are anything to go by. Latterly I was reminded of the svelte looking Tourer version of the Mazda6 that strongly activated my testing taste buds when one parked alongside. Now I have sated my appetite by putting one through its paces, a top specification version powered by the 148 bhp diesel unit (yes, there are petrol alternatives) and underscoring my original opinion for this product – a real class act that must be considered by anyone shopping for a quality class Tourer/Estate. I tested the car equipped with the accurate and light changing 6-speed manual gearbox that has well chosen ratios to exploit the flexibility of the diesel engine while having the ability, as a result of closely stacked lower ratios, to provide lively acceleration. Mazda claim that it can reach 62 mph (100 kph) in a respectable 9.2 seconds while topping out (where legal) at 130 mph. Aided by the power regeneration system (that I feel also adds to stability when slowing on a trailing throttle) and a Stop+Start system for saving fuel and emissions in traffic congestion (the engine is rated Euro 6 for emissions), Mazda claim a fuel economy bordering over 70 mpg though, I feel that the practical aspect and the lively performance of this vehicle will see most drivers happy at something close to 50 mpg. Performance is achieved in a refined and quiet manner although tyre noise through the medium profile Bridgestone tyres is probably just a tad higher than I recall from my earlier test. That said, this is a quality ride in all respect and a quality drive with responsive controls, powerful braking ability and impressive road grip. A car to be enjoyed and one that makes for an easy lifestyle. That lifestyle is highlighted by an impressive fascia presentation, obviously designed in Mazda’s European studio and with about every aspect of information a driver could wish for, including a large screen rear view camera system. The use of quality plastic, polycarbonate and bright metal indicates a modern image and a product of high quality. Driver comfort is close to the best in class, there is powered seat memory adjustment across a wide range of both height and reach, the steering column can be adjusted for reach/height and there is also power adjustment for the front passenger seat. Finally, the pedal position nicely spaced and with a comfortable angle plus plenty of space to rest the left foot. This SEL specification car also comes with leather upholstery, 3 stage setting heated front seat heaters LED daytime running lights, Xenon headlights with Adaptive Front Lighting system, and excellent integrated satellite navigation system, keyless entry and BOSE sound system. Available options include High beam control hill hold assist, lane departure warning and radar cruise control. Why have the Tourer rather than the Hatch Back? 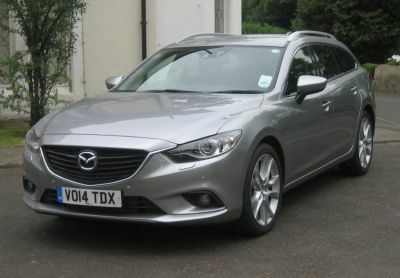 A common factor is that both are very comfortable 5-seat cars, the Tourer obviously has a load space advantage (506 litres) and fitted roof rails, the body style is becoming increasingly popular which should add to the already strong residual value for the total Mazda6 range and it is, in my opinion a stylish looker – oh, and by the way, there’s a space saver spare wheel under the luggage compartment floor instead of the puncture repair kit I had on the Hatch Back. Say no more! MAIN RIVALS: Vauxhall Insignia Tourer, Citroen C5 Tourer, Skoda Super Estate, Peugeot 508 Tourer, VW Passat Estate, Audi A4 Avant.